I hope you’re all enjoying this holiday season. We just had an epic week spent at Disneyland. It was amazing. Our feet were aching by the last day but it was okay because each step was a step well taken and when I think of all the many places we walked to it just brings a smile to my face because it was just such a fun trip with my family. My youngest son was finally able to go on Indiana Jones ride – which he’s been wanting to for years and years but each time he was too short so this time was a milestone and we rode that ride several times. It was by far his favorite. So much fun. Speaking of fun…I have a couple of great things to bring you today. The first is giving you a heads up on my newest GIVEAWAY! I’m partnering with several AMAZING ladies to bring you something ridiculously fantastic. Michelle Gessell over at Drawing nearer to thee has contributed her spiral bound wide margin book of Mormon to journal and write lots of notes and ponderings in it. I have one of hers too and I LOVE it. There’s tons of room to draw, doodle, write, and just make it your own. It’s wonderful, you’re going to love it! The GIVEAWAY also includes **** from Courtney Casper. I love all of her creations. I own them all, I think! It’s the perfect combination to go with the Book of Mormon and will help you just dive deep into your studying this coming year. Rene Alberts from Rene Alberts Designs has also contributed one of her original artworks – which is incredible, my friends!!! She is so talented. I purchased one of her prints and it’s my absolute favorite. It’s stunning. You will not want to miss out on this Giveaway! There’s tons more included, a cute tote to keep it all in, some of my favorite pens to journal with, and lots more so check out my facebook and instagram feed to learn more about how to get in on that giveaway. The winner will be chosen December 18th 2018 -An early Merry Christmas to you! Super fun, right?! I knew you’d like it! So it’s the last week of November and this is a really significant time for me because this is the time that I realign myself with my goals, my focus, and doing a major check up with myself. My kids go in for their yearly well-child check-ups each year and they show me the growth charts of what they were last year and how much they’ve grown since the last visit and then they also show what to expect for the next year too. This is that time for me, only not medical but mentally, spiritually, and just checking in with myself and where I’m at on the path and journey. I know a lot of people who don’t do this. When I ask my clients it takes a few minutes for them to think and reflect back, like, “what have done this last year?” And when I ask where they’re going next year they generally don’t have a clue. When you focus on perfecting yourself, in becoming a more deliberate and refined you – your influence and example will bless not only yourself but all those you come in contact with and the generations that follow.
. I’m not going to get into detail today about my goal planning process – that’s another podcast down the road but today just more centered on the focus of our year and making sure we’re moving forward and spending our inheritance wisely. Let me share this experience I had. Several years ago we own kayaks. I love kayaking. We bought two tandem kayaks and my two youngest were really little so we could fit three in one kayak and three in another where two of us would paddle and the youngest was our cheerleader/announcer – like, “go faster! They’re winning!” And I’d look at them like, “I know. You don’t have to tell me.” But it was fun. So my husband would take one kayak and I’d take the other and we’d have to rely on our paddle buddy to help move the kayak along. This proved quite difficult as they were still learning. They got tired quickly and easily. Sometimes they’d just stop paddling altogether. So one afternoon we’re out on this beautiful lake with tons of little, I don’t know what you call them, alcoves, maybe – little pockets to explore and get close to birds and other wildlife and I had this direction that I wanted to go in so we’d row for a bit and then they’d get tired and stop paddling. So I’d continue to row but the weight of everyone on board and trying to paddle and steer by myself was difficult so I’d stop paddling and rest for a minute in the soft breeze. But, this soft breeze that felt so nice wasn’t entirely on our side. Each time the wind would blow it would push us further and further from our intended goal and pretty soon we found ourselves very far off from our original desired destination. It’s like this with our lives. I think all of us has some destination we know we want to arrive at. I know that for most of us we have spiritual goals, we want to strive towards living a Christlike life and to follow Him. We have temporal desires to do or accomplish things. We want to someday be able to…We want to eat better, get more sleep, exercise more. We have a vision, albeit sometimes in the far distance of a goal, a destination we want to strive towards. But life is busy. We get distracted by all the day to day things. Our heads are looking down at all these things and with each of those things we get pushed further and further away from our goals just like the wind pushed us further and further out into the lake. We have to keep our eyes focused on the goal and we have to keep paddling, even if it’s slow. Progress is progress. I want you start here. I want you look up and see if you can narrow your eyes on that distant goal. Do you have one? Do you know where you want to go? Who you want to become? What you want to work towards? If not, this is a great time to start thinking about it. Each year I choose my theme or focus for the coming year. It’s generally just a word, although sometimes it has been a phrase too. This focus has been hugely helpful in my life and a way to keep my eyes on that destination so I can prevent myself from getting caught up in the drama of life and the distractions and such. It’s easy enough to remember that I can ask myself all the time, am I still rowing and paddling towards my focus? Some words I’ve chosen in the past have been, “Abundance,” One of my favorite years by far. I wanted to find Heavenly Father’s abundance all around me and amazingly when I looked up and focused on it, I found it everywhere. Another year I chose, light and I wanted to be a light, I wanted seek the light. It was a beautiful year. So ponder this. Find your word and with everything you do, think, and say make sure it exemplifies that focus. When you study the scriptures you’ll be amazed at the differences you’ll see and read as you’re looking for that word, that concept. You’ll start noticing things all around you and little by little – as if with each paddle stroke you’ll become more and more like that word and focus you chose. This may seem an odd topic to be bringing you in November. Goals and the New Year but like I said earlier this is my time that I do my check up – I want to see how I fared and how much I grew in this area over the course of the year. This is when I choose my next focus and my goals and I do this now for several reasons. I’m only going to share a few with you to get your wheels turning and hope that maybe you might want to consider this time too. Why the end of November? If you think holidays for moment – October is Halloween, November, is Thanksgiving, December is Christmas, and January is New Year’s right? Most people start the New Year’s resolutions and goals on the first day of the new year – make sense but I don’t like to do that. One, in my opinion New Year’s day is a really difficult day to start new habits and goals. Think about it, you just stayed up to the wee hours of the morning celebrating New Year’s Eve. A lot of people have functions and special events that happen. You’re still recovering from the after math of Christmas and holiday’s – clean up, with the mess, recovering financially, and mentally. We’re kind of tired. So it’s more of a challenge to kick it into high gear and be excited to start these new goals and new habits. We’re also not quite there mentally either – or as much as we could be, I should say. I love doing this work now because of where I’m at mentally. We just celebrated Thanksgiving. A holiday where we focus on our abundance and all the things, people, and experiences we’re grateful for and now we’re looking forward to December and Christmas. Light the World is available on LDS.org. A lot of people will be doing their countdown to Christmas by centering their thoughts on the Savior. We’re more charitable, giving, kind, and in a state of love right now. I can’t think of a better time to reflect on my growth and journey from last year than now. I can look at it with grateful and abundant eyes. I can look forward to this coming year with love and clarity being partnered with Christ. This is the perfect time to pause, breathe, reflect, give gratitude for where you’ve been and the terrain you’ve crossed and now to focus and plan. So that’s my number one reason why I love reflecting and goal planning and starting my new goals and focus in December. Another reason I love starting now is it gives you time to practice. A lot of things tend to come up when we want to start something new. My job focuses a lot on thought work and any time you even entertain the idea of starting something new our brain tends to freak out a bit and want to give you push back. You might want to have a goal or focus word like, “love” – say that’s what you chose for the year, you want to increase the amount of love you feel, you want to love others more freely, and to forgive more readily. So when you start to entertain these thoughts your brain will throw things up at you, “You can’t do that.”, “Remember yesterday when you got mad at so and so and you yelled at them? You’re not loving. You can’t do it.” And generally it’ll list off several other things to say as well – which is normal for your brain to resist change – even if it’s good change. Our brain is a beautiful piece of machinery that is working perfectly to keep you safe, alive, and functioning. This is the natural man – Heavenly Father in His infinite grace and wisdom also gave us our higher brain or prefrontal cortex so we could override these natural man tendencies to not just function and stay safe but to thrive, to evolve, and to grow. When those thoughts and pushback arises you don’t have to listen. You don’t have to believe it. You can use your higher brain to reprogram that beautiful piece of machinery to believe these new thoughts and align to a new goal. It does take practice and time and a lot of redirecting those thoughts back to where you want them to go. So any time the pushback arises, don’t freak out – it’s natural. It’s not a sign. Nothing has gone wrong. Just breathe and re-direct it to your focus, to your goal, to the thought you deliberately chose. Be careful here too. Our brain likes to spiral and create more of a problem even when there isn’t really a problem. Because I missed a day, or I wasn’t as patient as I wanted to be my mind wants to throw in the towel and give up. It throws thoughts out like, “see, I knew you couldn’t do it. You’ll never be able to do it or be that kind of person.” Then it continues downward to attack my value and self-worth and I just end up feeling miserable and low. Each time those thoughts pop up just gently remind yourself that it’s just your brain’s way of trying to protect you – which I realize sounds ridiculous – but it’s trying to keep you from doing or becoming something new – new is scary, new is unknown, new could mean a threat to your brain so it tries to protect in the most unlovable ways sometimes to do that. So use your higher brain, keep redirecting your thoughts to think the deliberate thoughts you chose. Practice it again and again and little by little you will reshape your brain, you’ll train your brain to think and function the way you want it to. Remember, there is no upside to believing those negative thoughts about you. None. You are 100% of value and worthy. You didn’t come to earth to claim your value or worth, you brought it with you as a royal son or daughter of God. One thing to look out for ahead of time is that in our progression with new goals and resolutions is that when we get that push back and we mess up and we feel like we tarnished our perfect record and so we give up. Did you know that roughly 92% of people that make their New Year’s Resolutions end up quitting by the first two weeks into February. That leaves only 8% of people that actually follow through with their resolutions. There’s a lot. There’s several factors to that but one of the biggest is that people don’t like having a “messed up” record – because they can’t say they exercised everyday this week – they only did 4 days instead of 6, they get discouraged and let those negative thoughts in and pile up and they give up. But starting early, starting in December really helps you out with that. I call it the practice round. very good at it yet so when it came time to tally up the score after each round I’d say, “Oh, that was just the practice round”. Yes…obviously. But we can take this same concept for our focus and our goals. You won’t have a “tarnished” record. Starting in December means you have 31 days of cushion, my friends to keep you going, and practicing, and motivated to continue. Each time something happens and you’re still learning how to implement your new focus just tell yourself, that’s okay, it was just a practice round. Let’s try that again. 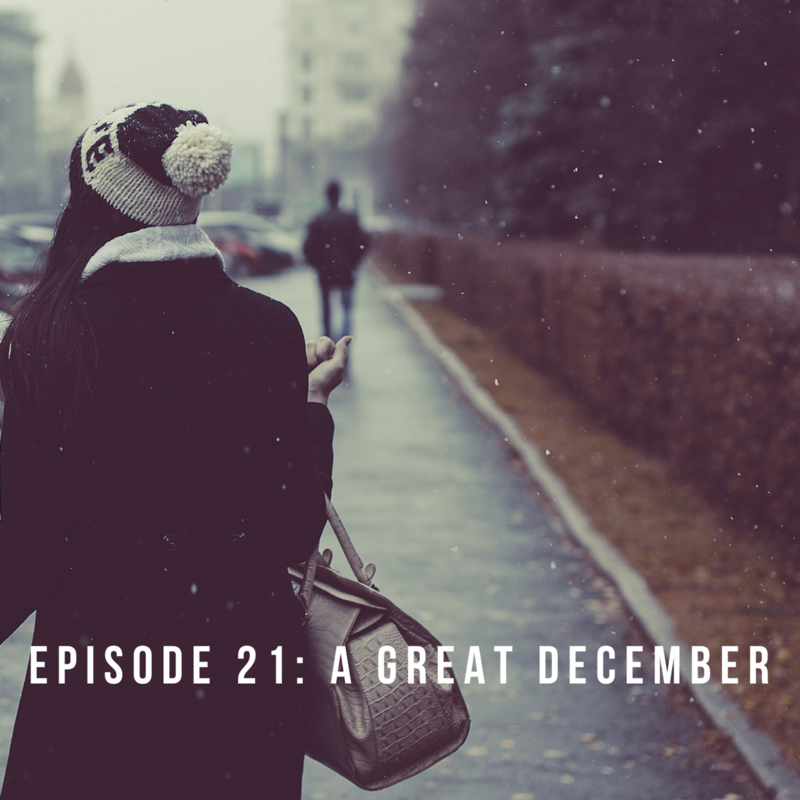 Another reason I love starting in December is that going by statistic’s standards most people get weary of these new goals and start giving up a little over a month of working on them – by starting in December, your weary time is the beginning of the year – a time when so many others are just starting theirs. So in this manner you get extra support because everyone else is talking about it. There’s this energy that’s around you and because you’ve already begun you can share your journey with them and by listening to them speak of their plans and goals it invites you to recommit to your plans and goals and focus to help you over that hump. It’s like in the movie Moana or even Castaway with Tom Hanks – As you’re sailing out to sea the first bit isn’t to bad but it’s difficult to get passed the reef and into the open sea. The waves are strong. Your ship might take a beating but after that, it’s smooth sailing. So think of the challenges like that – just getting passed the reef. Everyday is a clean slate. Each day is a new beginning. The biggest thing is that you’re moving forward. Start with your word or phrase of the year and keep your eyes glued to it. Keep rowing, keep paddling, keep moving forward. You’ll be amazed at how much growth you’ve had in a year. This is such a beautiful, abundant time. I love aligning my life, my mind, my heart in the direction that leads towards Christ. What better way to start the holiday season than to go into it with renewed goals, a clear focus, and an ambition to become more like Him? So why not start in December? December to December is a great time line. Choose your focus word or phrase and share them with all of us! I’d love to hear them! Share them in the LOVE AT HOME Facebook group and let’s chat! Talk to you later my friends!